Regulation of immune responses is tightly controlled through a balance of co-stimulatory and inhibitory checkpoint receptors, often exploited by many cancers. Therefore, therapeutics that block inhibitory receptors or activate immunostimulatory checkpoint receptors have proved to be powerful agents to restore anti-tumor immune responses, such as anti-PD1 therapy. However, developing drugs targeting these checkpoint proteins has proved to be quite challenging as cell-based assays used to screen for functional drugs are often difficult to create, involve the use of primary cells, and have long, complicated protocols. The PathHunter Checkpoint assay portfolio solves this bottleneck with an expanding menu of cell-based assays that can enable screening & potency assays for immunotherapy drugs. These biologically relevant cell-based assays do not require primary cells, have a simple protocol, and provide a highly sensitive response in less than 5 hours. Subtract primary cells. Add reproducibility and ease of use. 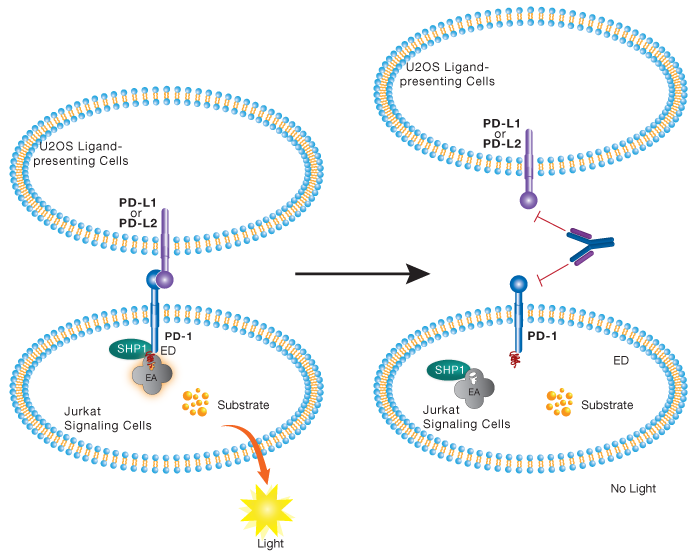 The PathHunter PD-1 Checkpoint Assay was performed with Pembrolizumab (anti-PD-1 antibody) and PD-L1 ligand presenting cell line. Data show consistent EC50’s and S/B on three different runs of the assay within the same plate with less than 4% relative standard deviation (%RSD). For more details on how the assay works, please visit the ‘Assay Principle & Data’ tab above. Complete full assay in less than 5 hours with simple, add and read protocol. 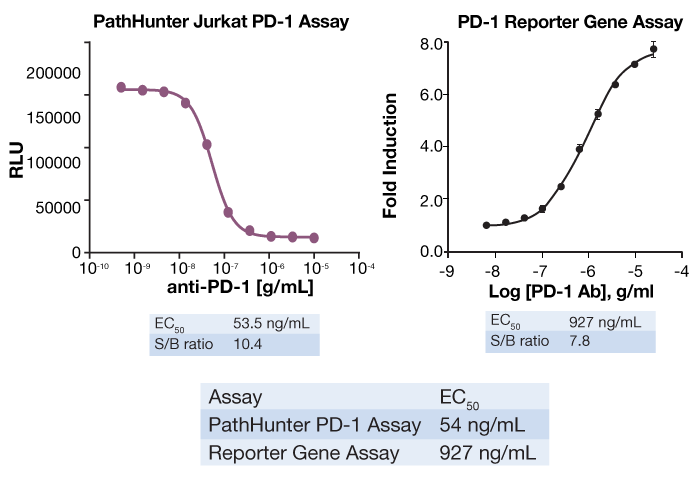 Using the same anti-PD-1 antibody (BioLegend Catalog #329912), we were able to compare the assay performance of our PathHunter PD-1 signaling assay to a commercially available reporter gene assay, and observed that the PathHunter PD-1 assay demonstrated more than 15-fold better sensitivity than the reporter gene assay, with a slightly better assay window as well. PD-1 is known to be phosphorylated with an as yet unidentified src family kinase, which causes the recruitment of the SHP-1 protein to the phosphorylated PD-1 receptor. Testing of the PathHunter PD-1 assay with small molecule inhibitors that are known to inhibit several known src family kinases has shown inhibition of the SHP-1 recruitment to PD-1, demonstrating that the PathHunter PD-1 assay can be used to identify novel small molecule inhibitors of this exciting immunotherapy target. Cell-based assays based on the target biology to accelerate your immuno-oncology drug development programs.